Tamariu gets its name from the tamarisk (a type of ever-green) trees that shade its small promenade. Tamariu is still a relatively small village, although no longing making its living from fishing, you can still find small fishing boats pulled up on its shore. Along with Llafranc and Calella de Palafrugel, Tamariu belongs to the municipality of Palafrugell. The beaches are similar in that they are small and sandy and belong to fishing villages, but Tamariu is the smallest of the three. The beach of Tamariu was awarded a Blue Flag for the last five years. 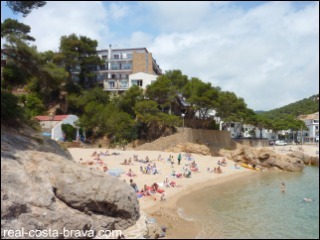 Although there is only one main beach of Tamariu…there is a small beach called Platja dells Liris to the right (if you are sat on the sand) of the main beach. There is also another beach (well, a concrete bank with a small pebble beach in front) to the left of Tamariu beach, called Aigua Dolca. If you want to get away from everyone, this is the place to lay your towel. Want to read more about Tamariu? Want to see what the beach looks like right now?…take a look at the beach webcam. AIGUA XELIDA - literally means "frozen water". Named because of the fresh water springs under the sea that cause a sudden drop in temperature. The beach is a small stoney cove, about 1 km north of Tamariu. 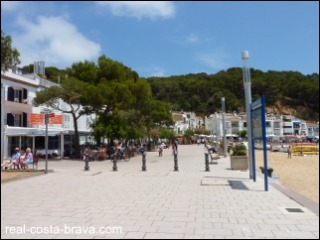 Aigua Xelida is accessible on foot, from Carrier de Cala Marquesa or you can walk from Tamariu along the Cami de Ronda. 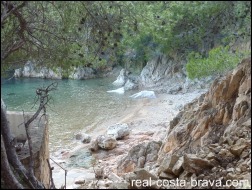 LA PEDROSA - is a small pebble beach, 1.85 km south of Tamariu. 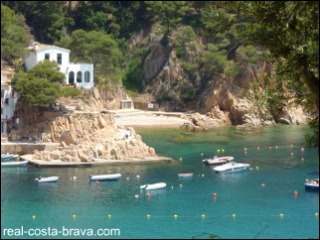 La Pedrosa is accessible on foot from Tamariu along the Cami de Ronda or by kayak/boat. EL CAU - is a small stoney cove, about 1 km north of Llafranc. El Cau is accessible on foot, from Sant Sebastia lighthouse and the residential streets to the north of it, or you can walk from Tamariu or Llafranc along the Cami de Ronda. 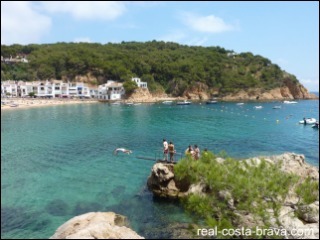 If you watch the video from the start you can look at stunning Calella de Palafrugell and Llafranc. There are a few car parking spaces right behind the beach, on Carrer Riera (you have to get here early to get a space). There are more car parking spaces further along Carrer Riera (heading away from the beach) and also a pay & display car park. More parking can be found if you take a right turn off Carrer Riera on to Carrer Pescadors and then turn left on to Carrer Muga (there is a dirt floor car park at the end of this small road). You can also park on Carrer Aiguablava (this is quite a steep hill though). Zoom in on Palafrugell and then on Tamariu on the map below to see the numbers and names of the roads. The nearest motorway is the AP7. 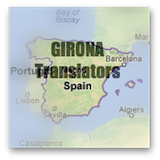 The nearest hire car companies are in Palafrugell - Masca Motor and Rent Services. Both of these car hire companies will drop off and pick up the car for free in Tamariu. You can also get to Tamariu by bus from Palafrugell. To get to Palafrugell you can catch a bus from Flaca, Girona and Barcelona. Please see for details. The nearest train station to Tamariu is Flaca (20km away). 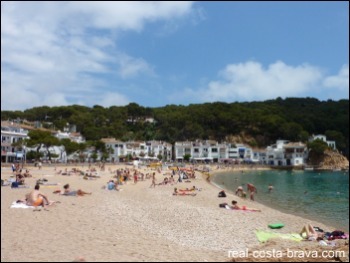 The nearest Costa Brava airport to Tamariu is (40 km away). 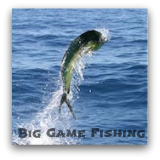 Check out flights at .